NEW for 2015 is our new Mega Brite 2 pc LED Module Strips! 3 LED chip design in a row, mounted on an alumimium plate offer a strong and bright design. Up to 10 times brighter than our previous 8 pc kit and half the price! We have some of the older round type 8 pc kits left on closeout (while supplies last i n Red, green, & Yellow). Work on any 12 volt DC charging system- no battery needed! Use less than 1 amp- almost nothing!! Available in 5 hot colors: red, blue, green, yellow, & white. Super popular on Cycles, Choppers, and snowmobiles. 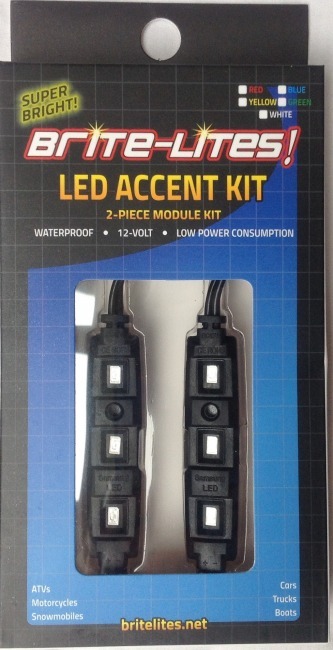 NEW for 2015: 2 piece Accent LED light Kit utilizes 3 1-watt SAMSUNG Hi-output LEDs to give more light and maximum flexability for installation. 3M brand adhesive mounted on a aluminum strip allows the 2 LED modules to be mounted almost anywhere and the aluminum strip has a hole pre-drilled thru to allow for a screw or rivet to secure even under the vehicle! Work on any 12 volt DC charging system. Come packaged as 2 modules in a kit, about 36" of wire between modules, and about 48" of lead wire to the first module. Boxed with full installation instructions and tips on the back.